Come & Create! - Learn 2 Fuse Glass... & More! 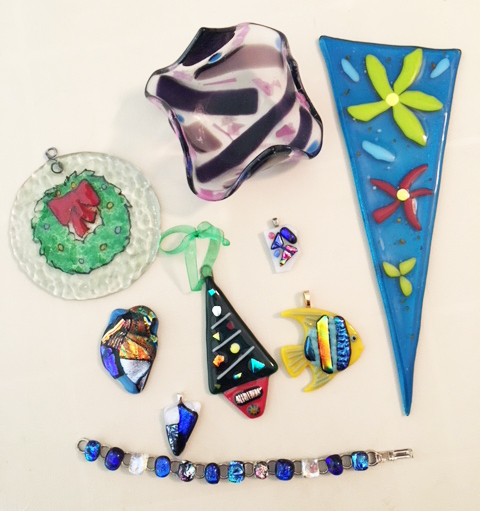 Learn 2 Fuse Glass... & More! is based on the concept of Arrive, Sit Down, & Create! It allows Attendees (EXISTING STUDENTS) to come to a quiet place to create something that they've previously taken a class in here... or even to create something unusual or unknown (however, NO Instruction is included). This Session also allows those who don't have kilns at home, a place to come to create some thing(s) on their own & have fired here. Attendees MUST HAVE previous Glass Cutting experience and/or MUST HAVE taken Pre-requisite Classes here (at Start Night Creations) of either "Intro to Glass Fusing", "Beginner's Jewelry", or other Beginner's classes. Attendees should have a fairly good knowledge of working w/the glass, scoring it, arranging it, and Grinder/equipment usage prior to coming to this Session. NO INSTRUCTION Provided. It's a Nice time for friends to come & enjoy creating and chatting! Tools, fusible glass (opal & transparent), unlimited use of Grinder, and (1) Firing is INCLUDED with Session Cost. Plates, Bowls, Ornaments (other than Jewelry) may be created, provided Attendee has taken specific previous class(es) here, OR has a proper idea of what to do. ​The Cost of $29 covers Jewelry. For any other & larger project(s) created, cost will be adjusted to include the balance. For Example: If you'd like to create a $49 Bowl, the initial class cost is $29 + $20 to equal the cost of the Bowl. PLEASE CONFIRM AHEAD OF TIME WHAT YOU'RE INTERESTED IN CREATING! Cost EXCLUDES Instruction and Dichroic Glass. Dichroic Glass is available for purchase in the Studio. Molds + Slumping or Draping incur additional fees. Use of Kiln to fire something made at home, incurs additional fee(s). If creating Jewelry: (2) Pendants OR (1) Pendant + Earring Set is included in $29 cost of Session. Add'l. pendants/jewelry created (other than Minimum) are priced "a la carte". Any additional fees are due at end of Session in Cash/Check only. Please see Description (above) for "PARTICULARS"! Click on "View Details" for more Pics & to Register.